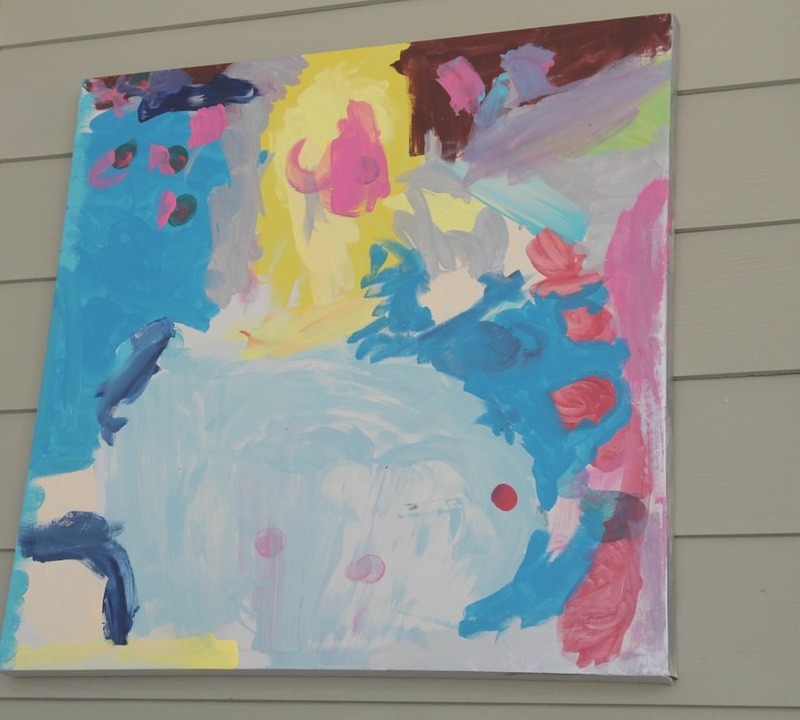 Here's a DIY summer art project that is kid-friendly. Happy Thursday everyone! 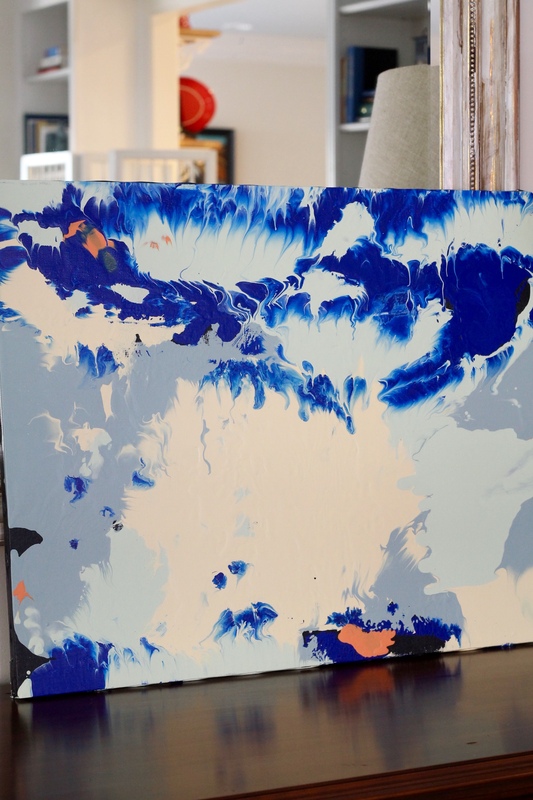 We have a DIY art project that’s kid-friendly for you today. For those of you who were wondering, Mom survived her meeting with the Historic Commission. They have to replace the tree with a “significant”, which they already planned to do, and they have to submit their landscaping design for approval. They already have those plans and will be submitting them soon. Do you see that bike picture in the background? Well, it had completely faded and was looking super dull. This photo was taken last summer. This photo was taken this summer. Can you see how it has faded? 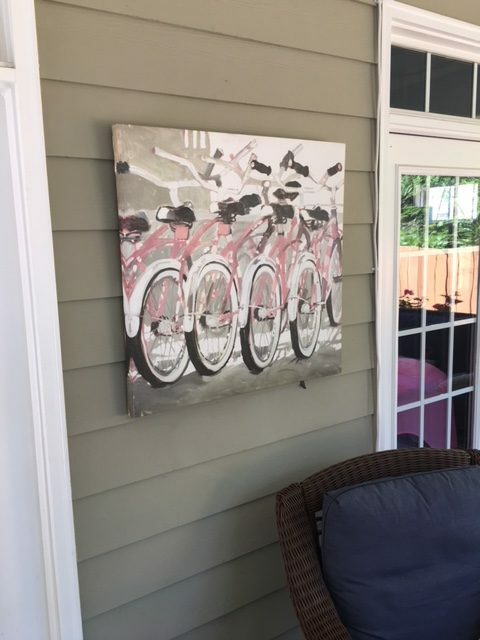 I loved having some art outside, but it was time for a change. We needed something that was looking a little fresher. I liked the size of the canvas because it filled the space perfectly. I thought about it for a while and decided I would commission an artist to do a personal piece for that space. Here is my artist. 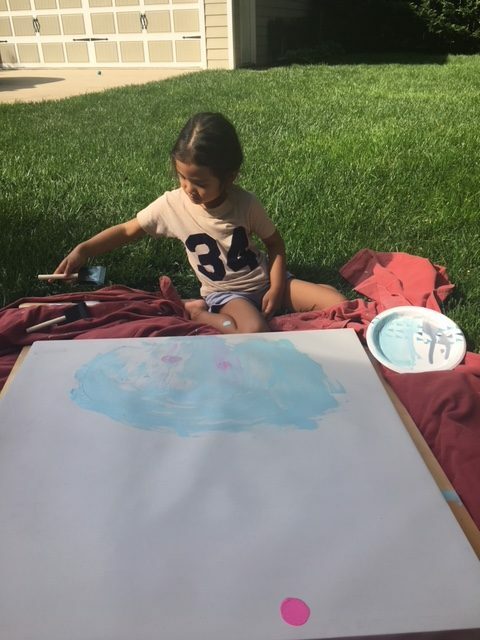 She was so excited to create a masterpiece for the porch. 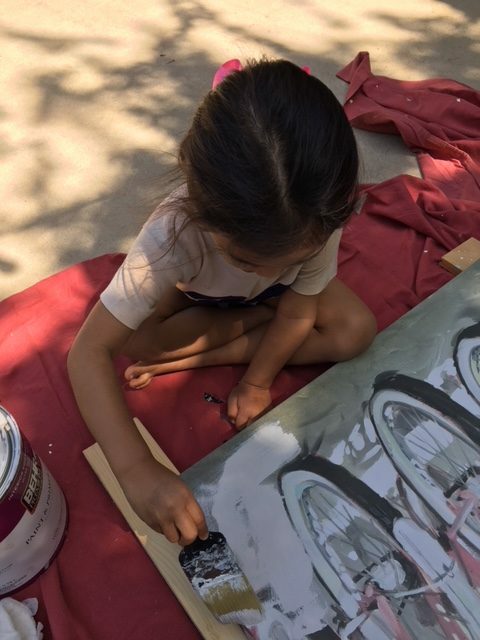 The first thing she did was paint over the bicycles. I just grabbed some house paint, and she painted the canvas so she could start with a blank canvas. She took her assignment very seriously. 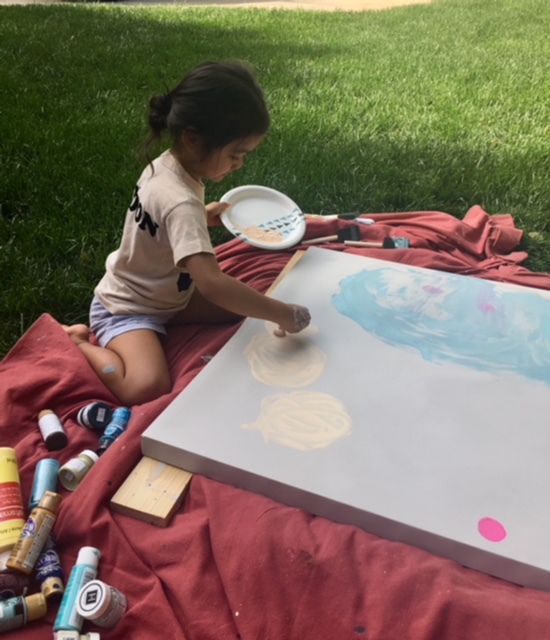 She painted the first coat before nap, and we let it dry during nap. All artists need naps, right? That helps their creative juices to flow. After her nap and snack she got to work. The canvas was dry and blank. I then brought out tons of different size brushes that I have from a variety of projects. I also have a bin of those small little tubes of paint. I set it out and then watched her work. Here she is with a different brush and color. I really enjoyed watching her in her artistic zone. I also put on some Disney music, and she was doing some dance moves in between painting. She worked about an hour on her masterpiece. 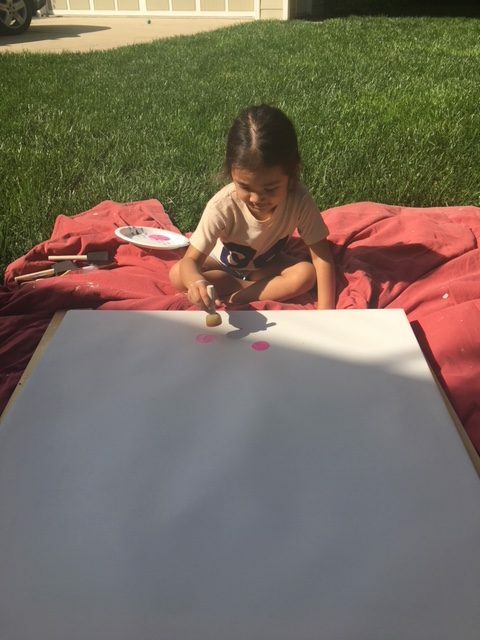 She was so proud of her DIY art, and so were we! We let it dry and then hung it up. The first thing she did when she woke up the next morning was to go to the porch to see her work. I love how it looks. 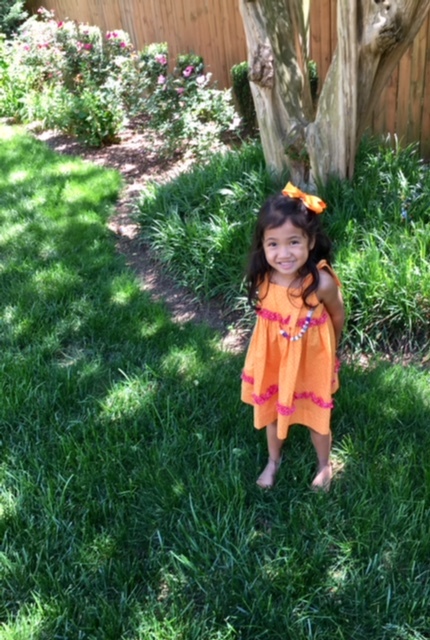 It is so fun for the outdoors, and it was a win, win. This won’t be her last commissioned piece for me! 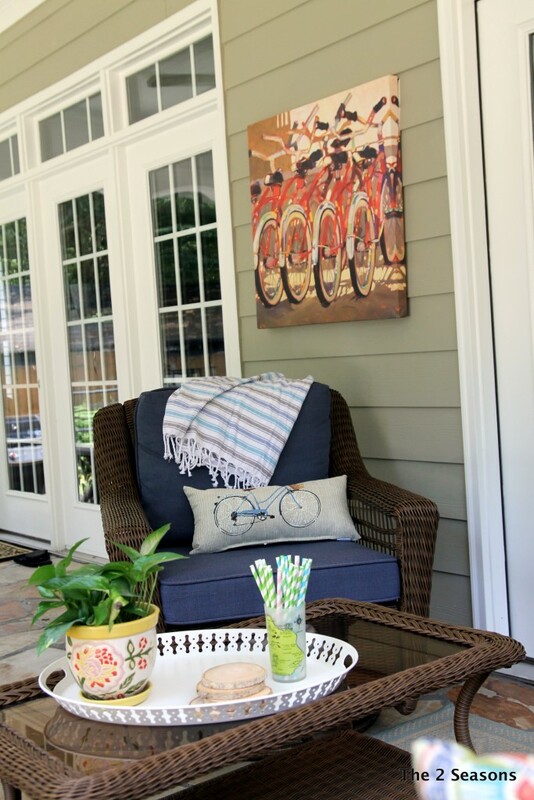 If you have some kiddos or grandkids, this DIY art would be a perfect summer project for an afternoon. 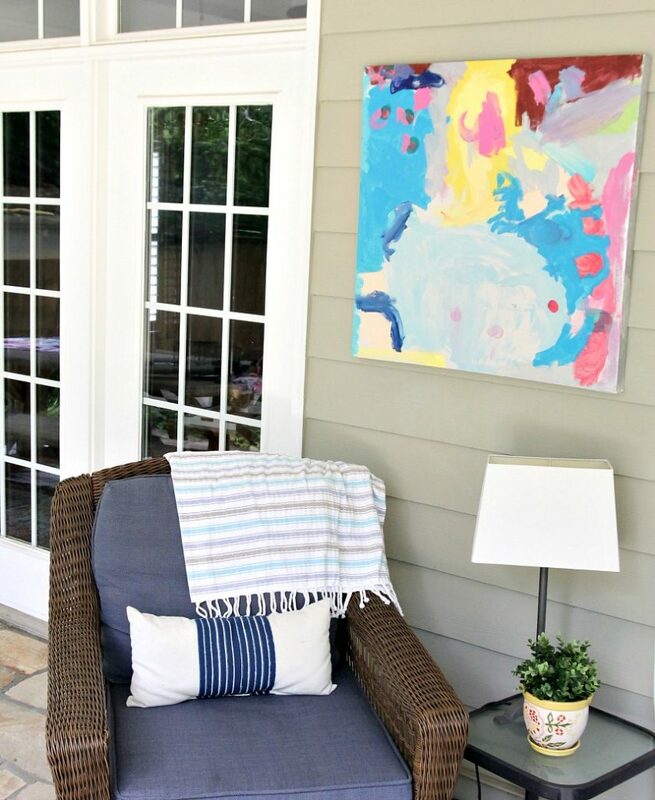 Then you could add your own commissioned art to your outdoor space. If you would like another DIY art project, here is a good one. I love this creaticve project. What a great way to encourage creativity. Love all of the great ideas that you give me for my grandchildren. I started with the balance bike idea, and that worked great! I had never heard of one before. And this project is great to encourage creativity. Thank you for all of your hard work and for sharing. Sherry, look back in our projects, and you might find some other things your grandchildren can do – like put paints in a zip lock baggie and let them make designs with them. Oh my goodness it turned out so pretty!!!!!! She did such a great job. We were surprised how well she did.